When you first start looking for Hares it is easy to confuse them with Rabbits. Sometimes even experienced watchers may be unsure of what they see if they only get a quick glimpse. But there are a few identification tips which, once learnt, can almost always help you to correctly distinguish between hares and rabbits. 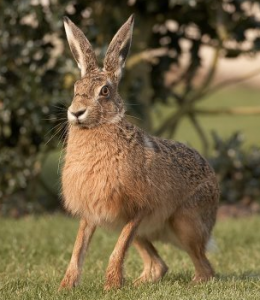 Hares are a lot larger than Rabbits and can weigh twice as much! Hares are golden brown in colour, whereas Rabbits tend to be grey. A Hare’s ears are larger with distinct black tips. A Hare’s back (hind) legs are slightly larger. Hares live solitary lives above ground, hiding in cover or shallow depressions. Babies (leverets) are born above ground, fully furred, eyes open and ready to run! Rabbits live in warrens, which they have burrowed into well-drained soil. A young Rabbit (kitten) is born underground, blind and naked. Hares run faster than Rabbits. Hares tend to live solitary lives, whereas Rabbits live in groups. 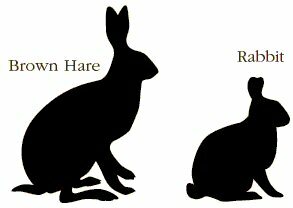 When frightened, a Hare will lower its tail but Rabbits will raise theirs, exposing a white underside. There are two types of Hare in Britain – the Brown Hare (scientific name Lepus europaeus) and the Mountain Hare (scientific name Lepus timidus). The Mountain Hare is largely confined to Scotland except for an isolated population in the Peak District which borders the eastern side of the Greater Manchester area. Here you may be lucky enough to encounter Mountain Hares around the Oldham/Tameside border above Mossley or just south of Dovestones around Swineshaw Moor, Buckton Moor and Alphin Pike. 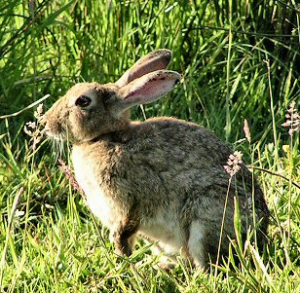 Elsewhere, over the vast majority of our area, the only hare you will encounter is the Brown Hare . In the few areas where their ranges overlap, remember that the Mountain Hare turns white in winter, but the Brown Hare stays pretty much the same colour all year round. Silhouette of Hare and Rabbit. Project supported by: Sita Trust, Peoples Trust for Endangered Species, Greater Manchester LRC, Merseyside BioBank and the Lancashire Environmental Records Network. Please respect image copyrights.